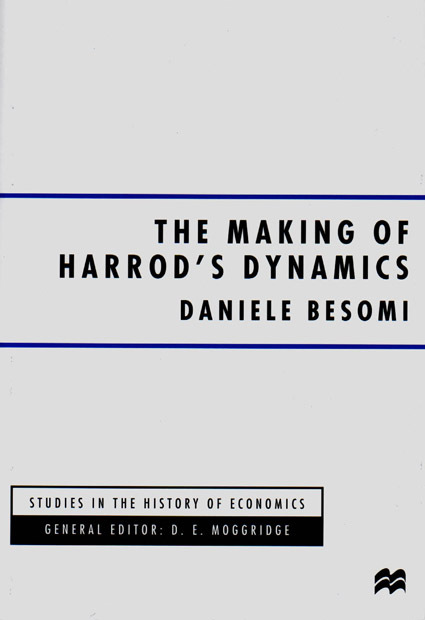 This study is an inquiry into the origin and early development of Harrod's notion of 'economic dynamics'. It examines how Harrod gathered the components of his theory, thus making it a study in chronology. The organizing concept is the instability principle, which responded to Harrod's pre-analytical postulate that some sort of destabiliser must be introduced at the outset in order to make a theory of the cycle possible. The method of analysis presupposed the distinction between the problems of determining the level and the variations in the level of activity, the first being logically prior to the second, while the analytical instruments giving voice to both principles were the accelerator and the multiplier. This research also examines the relationship of Harrod's dynamics with the 'orthodox theory' and with the alternative approaches to dynamics. The point of contact with orthodoxy was the method of analysis, which Harrod generalised from the partial equilibrium approach. The point of detachment was the instability principle, which Harrod saw as a rejection of the traditional assumption of the stability of equilibrium. This also differentiated his approach from the "time-lag theories of the cycle": in Harrod's interpretation, the econometricians' notion of dynamics (but also Robertson's, Hicks's and Lundberg's) saw the presence of time lags as the cause of the cycle, which Harrod thought instead to lie in the instability of equilibrium. Trade Cycle; Statics/Dynamics; Growth; Stability/instability; Moving Equilibrium.